Naval Amphibious Base (NAB) Little Creek, part of Joint Expeditionary Base Little Creek-Fort Story, is located in Virginia Beach, Virginia. The mission on base is to support 27 Navy vessels, 15,000 personnel and to serve as a major operating base for Atlantic Fleet missions. Radio Island at Morehead City falls under the jurisdiction of NAB Little Creek and serves as an amphibious embarkation/debarkation area for the US Marine Corps. 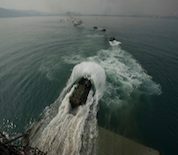 Major units at NAB LIttle Creek include Explosive Ordnance Disposal Group Two, Naval Beach Group Two, Naval Construction Force, Naval Special Warfare Group Two, Naval Special Warfare Group Four and Tactical Air Control Group Two. Additionally, the Navy School of Music, which provides specialized musical training to members of the Navy and USMC military bands, is located at NAB Little Creek. This NAS Little Creek directory features the critical info you’ll need to navigate through the many facilities and recreational opportunities available on base.